OWEN: So, have you got any gigs comin up? KEARA: Yes, a few things. OWEN (TO J.P.) Have you seen her? RAYMOND: Aye, she’s no bad. Ah seen her once. She did a bit o stand up an then a mad auld lady character hing. It wiz quite funny. CHRIS: So, when can we see you next? 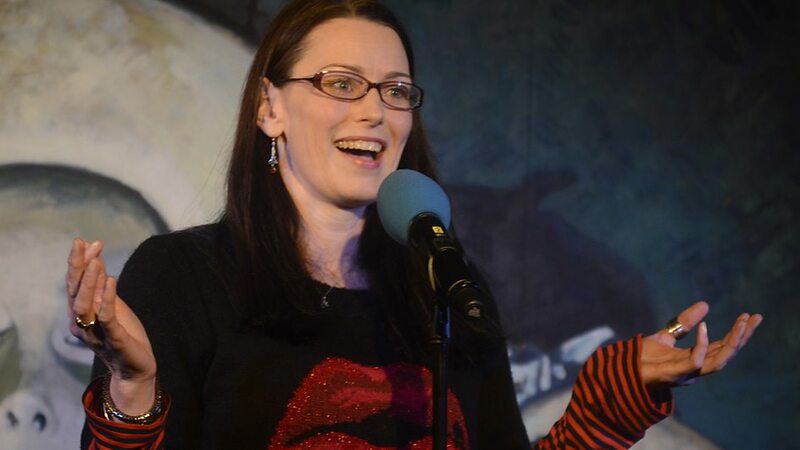 KEARA: Well, I’ve got a gig on Saturday night, a new comedy cabaret show I’m hosting. I could sort tickets for you all. KEARA: Eh, no. In Edinburgh. KEARA: And on Friday I’m on the radio doing another character. RAYMOND: Aye, It’s a Podcast. J.P. She’s on YouTube too. KEARA: It’s radio. I’m on the radio on Friday. CHRIS: Where can we see it? KEARA: Just tune into the Janice Forsyth Culture Studio on Friday afternoon at 2.55 for five minutes. It’s a character thing I’m doing. It’s a wee series. It’s on over the next few Friday afternoons. Different characters every week. KEARA: Or you can listen again on iPlayer. CHRIS: Is that a podcast? J.P. She’s on Vimeo too. OWEN: Is it on your website? KEARA: It’s on BBC Radio Scotland’s website. KEARA: Yes. I’ll put a link up on my facebook page. RAYMOND: Don’t put me oan facebook! OWEN: He’s got an email. RAYMOND: Nah. Ah goat rid o’ that an all. Load-a auld shite. RAYMOND: (TAKES OUT WHAT LOOKS LIKE A SMALL CHILD’S TOY PHONE) Ah canny open links oan this hing. OWEN: He can’t even make a phone call on it. RAYMOND: Aye, ah cin. If ah toap it up. CHRIS: He never tops it up. RAYMOND: Aye, write it doon. Does embdy hae a pen? CHRIS: (TO RAYMOND) Do you have a radio? OWEN: So, when can we see you next? KEARA: Well, I’ll see you all here on Sunday for the game. 27/11/2013 Keara Murphy Comments Off on Is That a Podcast? Proudly announcing the first in a four part mini-series of my brand new comedy monologues. They are my cute wee babies. I love them all! I LOVE them all!!! And I love you too. I must say you’re looking really hot today. Have you been working out? And your hair! What’s going down with that? And, are they all your own teeth? They really are a marvellous fit. In fact, you are positively glowing! Are you in love? Or pregnant? Or about to do a crime? Or are you just a real smashing natural beaut? Anyway, you are beautiful. I love you! I really do. And I hope you love me too. Awkward if not, but I’ll take it on the chin. But, we all love babies, don’t we? Wee cute babies. Diddums!! Well, these are my babies. I love them all and I hope you love them too. Today, my first incarnation, Grainne O’Grady, introduces the theme for the series: single women looking for love. There is also a lovely cameo appearance by Mammy O’Grady (voice based on my beautiful dead Granny, who, had she lived, would be 120 years old TODAY!!!). Thank you, Granny, for your voice, which lives on inside me. Thank you Gus Beattie, everyone at The Comedy Unit, everyone at The Culture Studio (especially Zoe & Amy), Janice Forsyth, BBC Radio Scotland. Oh, and, em Jeff Zycinski… and my Mammy and my Granny (two of the funniest women I know). I was absolutely delighted to be asked to take part in Stand Up For Pudsey Live at The Stand Comedy Club, Edinburgh. It was recorded live and broadcast on BBC Radio Scotland last Friday. I appeared alongside some of Scotland’s finest comedians, delightfully hosted by one of my comedy heroes, Sanjeev Kohli. Click on the link below to hear the show. I am second on, so pretty close to the start. I did a five minute set which went down a storm, but sadly, my ‘Guising’ routine about children coming to my door at Hallowe’en and how I gave them short shrift was deemed a bit to close to the bone for a family audience on Children In Need day. Oops! You’ll just have to catch that one live in a comedy club near you next Hallowe’en.